This was me—sprawled out on a table in the wine garden at Disney’s California Adventure Park. It was the nearest place I could get to after exiting a ride with my kids and sensing I was going to collapse. It felt like I was in a dream. I had no perception of time or the fact that I had been non-responsive for over two hours. The paramedics that huddled around me were prodding me and asking me questions, but they seemed so far away and I was just too tired to answer. Too tired to open my eyes. Too tired to move my leg that had fallen asleep some time ago. In the back of my head I could hear a frantic voice whispering, “Something is very wrong!” But at that moment I was just too tired to even care. Little did I know that this incident was the beginning of an illness turned disability that would change my life. While many of my symptoms are present all the time, they are amplified when I'm sitting up and even worse when standing. Because of poor circulation and low blood volume my brain suffers from not enough blood and oxygen. My symptoms include brain fog, dizziness, migraines, chest pain, nausea and other gastric issues, temperature control problems, and extreme fatigue and lethargy. I get overstimulated quickly-- movement, light, and especially noise really affect me. Additionally, my body overproduces adrenaline, causing intense tremors and muscle spasms. Overnight I went from being a relatively healthy, active person to someone who could barely get out of bed. I have always been a go-getter and an overachiever-- from dancing 4-6 hours a day and attaining valedictorian in high school to an adulthood of teaching group fitness classes, owning and operating a small business, and being a wife and a mother of four. To lose my mobility and functionality was devastating. I was battling to come to grips with my new reality. But I was not the only one. My kids were also struggling to comprehend why I couldn’t do what I used to do. I have vivid memories of a meltdown my daughter and I had one evening as she was preparing for her dance recital. She came into my room so I could do her hair, yet I couldn’t even sit up on the edge of my bed long enough to do it—let alone make it to the recital. Over the holidays, one of my twins rushed into my room so excited for me to come see the Christmas tree he had helped decorate in the basement. After five minutes of him tugging on my arm begging me to come, and me trying to explain why I couldn’t simply get up and walk down the stairs, we both ended up in tears. As a mom, it is no fun to feel physically awful, but it is worse to know that your kids are suffering too. I hated that my illness was affecting my children. I needed a way to help them understand that my illness and inability to do things for them or with them in no way affected my love for them. Additionally, any chronic illness brings with it feelings of helplessness for the patient and the loved ones. I wanted my kids to find ways that they could feel helpful and loved. Thus, the book Mommy Can’t Dance was born. While this book is near and dear to my heart, I recognize that I am not the only mom struggling with chronic illness. I hope this book can help other mothers and children that are similarly struggling. 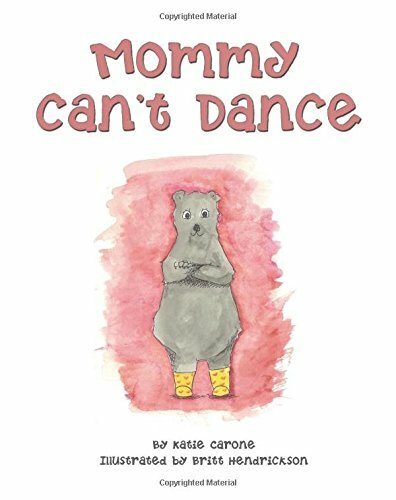 In an effort to further the advocacy and research on POTS, the illustrator and I are donating all proceeds of the book Mommy Can’t Dance to Dysautonomia International a 501(c)(3) non-profit founded by patients, caregivers, physicians and researchers dedicated to assisting people living with various forms of dysautonomia. While I wish I could write a fairytale ending to my personal story, that is simply not the case. I have found a few medications that have helped, and I continue to pursue additional treatment options through trial and error. Like many others who suffer with chronic illness, I understand that this may be a lifelong condition. However, I refuse to give up or give in, and I hope to someday report that mommy can dance again. Katie, you rock! You are using your gifts to bless everyone around you even when you are suffering. Thank you for sharing your story and your talents! Danica, It is SO hard being a mom and not being able to do everything we want to do-- or what are kids want us to do! Are you on the POTS fb page? I agree-- faith in God has been essential. It's hard to realize and accept that my plan for my life is not always the Lord's plan for my life. It has been a very humbling experience for sure! Nice to "meet" another Potsie mom. Feel free to shoot me an email: mommycantdance36@gmail.com. Thanks!